The First Mexican Treasurer of the United States. Rosario Marin is a compassionate mother, dedicated public official and consummate advocate for the disadvantaged who has served for 22 years at the local, state and national levels. 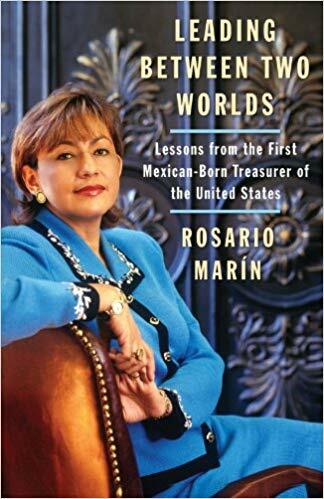 She is the author of Leading Between Two Worlds: Lessons from the First Mexican-Born Treasurer of the United States, which details her extraordinary journey. Rosario Marin professional career includes banking, non-profit organizations and the corporate world. She is a businesswoman, an author and an internationally sought after public speaker. She began her public service career while juggling family and work. Marin first served on the Huntington Park City Council and became Mayor of that city. 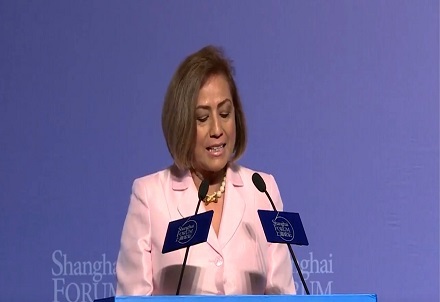 In 2001, Rosario Marin was appointed by President George W. Bush and unanimously confirmed by the United States Senate, to be the 41st Treasurer of the United States, making her the first immigrant to do so. During her tenure, she championed the Treasury’s financial literacy outreach program focusing on the 10 million Americans who did not yet have their own bank account. Then, in 2004, she launched her campaign for the United States Senate and was the first Latina in California ever to do so. 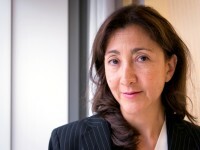 Rosario Marin served in Governor Arnold Schwarzenegger’s cabinet as Secretary of the State and Consumer Services Agency from 2006 through March 2009. She oversaw 17 state departments including the licensing of 2.4 million Californians in more than 255 different professions, the procurement of more than nearly $9 billion worth of goods and services, the management and development of the state’s real estate, oversight of two state employee pension funds, the collection of state taxes and programs managing the hiring of state employees. She has held numerous leadership positions with nonprofit boards. For her contributions, Marin has been awarded four Honorary Doctorate degrees from CSULA, Whittier College, St. Francis University and Woodbury University. She is the recipient of countless awards and recognitions, including the Rose Fitzgerald Kennedy Prize given to her by the Joseph P Kennedy Foundation at the United Nations in 1995 and the Outstanding American by Choice Award given to her at the US State Department in 2008. 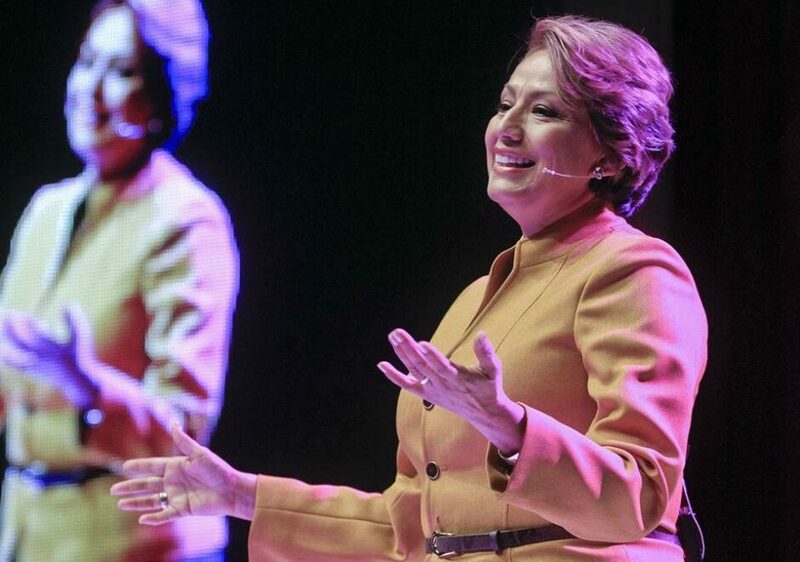 Rosario Marin received her BA in business administration from California State University, Los Angeles, and completed the Program for Senior Executives in State and Local Government at Harvard University’s John F. Kennedy School of Government. 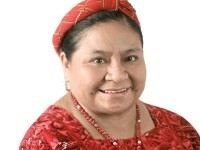 For her contributions, she was awarded an honorary Doctor of Laws degree from her alma mater in 2002. Advocating for the Rights of People with Disabilities. Financial Independence: A National Problem, An Individual Solution. Self Empowerment: When Challenges Become Opportunities. 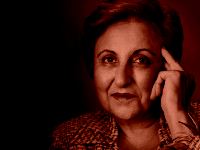 The Life Story of an Immigrant Who Made US History. Turning Obstacles into Launching Pads: From Self Doubt to Self Empowerment. Leading Between Two Worlds: Lessons from the First Mexican-Born Treasurer of the United States. "The American Dream is the fundamental story of this country, and my life is a grateful reflection of its reality." When Rosario was fourteen years old she moved from Mexico to California with no grasp of the English language and few resources. She has since become a trailblazer in every sense: from becoming the first in her family to graduate from college to having her signature appear on the U.S. dollar bill as the treasurer of the United States, and the first Latina in California to run for the U.S. Senate. Leading Between Two Worlds is the story of this incredible journey. Rosario exposes her most personal secrets and impressive achievements as she divulges what she has sacrificed and what she has gained in politics. She takes us through a deeply felt betrayal, her struggle through depression, the creation of her family, her devotion to advocating for the rights of people with disabilities, and her joyous return to Mexico. Rosario's story is the story of every immigrant who -- in the face of unbelievable adversity -- seeks to make it in the United States. Her journey is one of tragedy and triumph, one from which readers will draw inspiration. 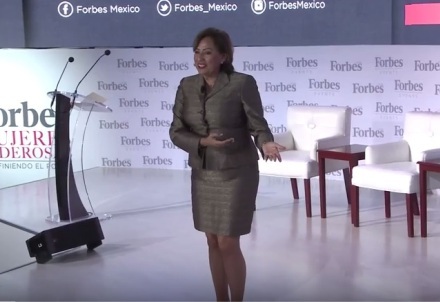 ROSARIO MARIN - Foro Forbes. "Powerful Womens"
Rosario was absolutely amazing. She was genuine and open and inspring. She clearly connected with the audience and reminded us all that we cannot control what happens in our lives, we can only control how we respond to it.